Hello. It’s ya girl Napoleon here. We’re a little over a week deep into No-Shave November and things are just getting going. For those that are unsure of why we as a society promote such an oddity as a whole month where the males do not shave their various facial hair, here’s a quick tutorial. The conversation initiated here is just what the goal of this month is: to spark conversation and raise cancer awareness. The idea is that many cancer patients lose their hair during treatment, so this is a time to give an ode to those that can’t embody Movember (a word combining mustache and November. Quite a nice little word if you ask me). Ideally one donates the money that would be used to shave during this month to cancer research, however other donations are obviously encouraged. As time has gone on, No-Shave November has gained steam – there’s even a Twitter account for this annual celebration. Check it out for some candid stubble pics: @No_Shave . Almost everyone these days knows someone – whether close to them or an acquaintance – who has battled cancer, and the topic hits close to home for many. On the whole, just a great cause. However, as with many great causes a combination of a flawed society mixed with all of our own human flaws has convoluted this event into being more about the personal growth ability of the individual’s hair, rather than the greater cause at hand. I’ve sadly heard from multiple of my male friends that they won’t be participating because they “get a few random whiskers, and really can’t grow anything on their face” or “I’ve been working on this for 2 weeks already *has no growth*”. I get that, however from a female perspective that scrutiny of males on another guy’s facial hair is all too familiar in the girl realm. Just as women everywhere push for less body-shaming of everyone on women, can’t we push for less facial hair-shaming (we’ll coin that term I guess) of men – especially for such a great cause? Ideally we could put aside insecurities of how much hair can/can’t be grown while judging glances and comments of handsome and clean, yet unshaven, faces are stifled. ***PSA: Your hair growing abilities does not pre-determine your worth as a man***. Heck if nothing else you get a month off from shaving guys!!! Show the world what those facial hair follicles can do, and don’t give a crap whether it lives up to ~society’s expectation’s~ of facial hair. If you’re conversely concerned with the strength of your growing abilities check out our article “Life With a Beard: Your Guide to No Shave November”. Pictured below is Guinness Book of World Record’s GOAT of beard growing. A master of his art. 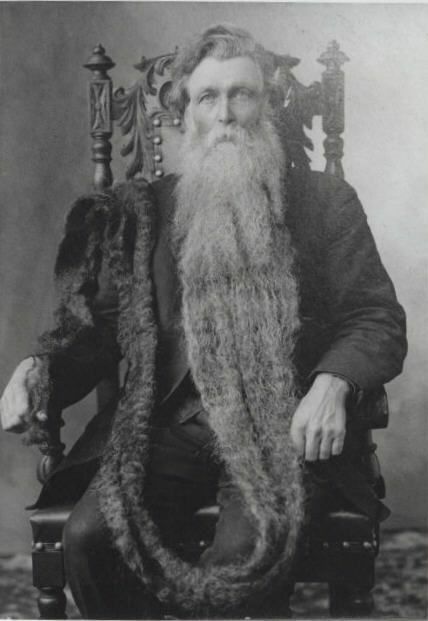 Hans Langseth, or better known to his friends as “King Whiskers”. Heck yeah. This guy was growing floor length beards at age 12 probably while other guys were working through voice cracks. No fact check for that last one but you get it. He is the ~goals~ of beard strength. And here’s the good news: that dude has thick hair flowing right over that right shoulder of his and that’s pretty sweet. But it’s also sweet if you don’t shave for the 30 days of November and roll into December with some scrappy facial hair. Maybe an uncommon opinion from me, but one that can and should be on the table. Guys: thank you to all who venture into the unknown that is No-Shave November. Whether you do or don’t I’m not here to explicitly tell you what to do with your face (yeah I know I wrote a whole article about it). Instead, I am here to let you know that no one else can tell you how to handle your facial flow either – wield your razor with power. Gals: I do not represent all of your opinions in the slightest. On a related note, I wish there was a No-Shave November for girls… but that’s a whole other co-article. As always, thanks for listening and I love hearing feedback from the people (very against the ideals of the actual Napoleon, I know). Have a great November, loyal readers, and stay trill. 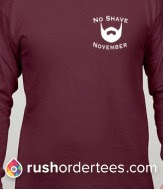 *Editor’s note*: If you’re serious about using No Shave to raise cancer awareness, consider buying the shirt below here. 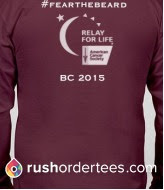 Profits go towards Relay for Life.